Initially Anthony Trollope had intended that The Duke’s Children should be published in four volumes to complete the six book ‘The Palliser Novels’ in a similarly comprehensive way to ‘The Last Chronicle of Barset’ which concludes ‘The Barchester Series’. In the event it was finally reduced to three volumes and Anthony had the formidable and unpalatable task of cutting out approximately one quarter of the original text. The amended original manuscript has lain neglected in the Beinecke Library of Yale University for many years. However, over recent years Professor Steven Amarnick, Professor of English at Kingsborough Community College, City University of New York, has been patiently working to restore the work to its original fully extended version. During the latter part of this period he was assisted by Robert F Wiseman with Susan Humphreys. Fortunately Trollope had used a specific method to separate these relevant cuts from his intended corrections but the task of deciphering the script has been long and difficult. The end result, however, is superb. 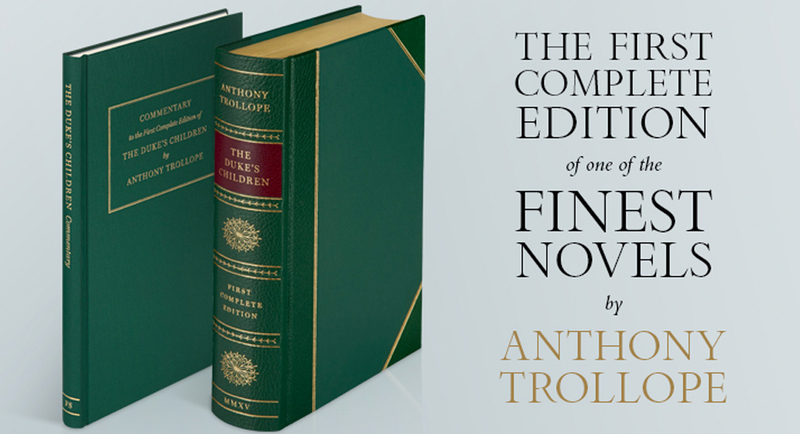 Finally the result of all this hard work is about to be published as a fine edition by the Folio Society in collaboration with the Trollope Society. This partially ‘new’ Trollope will soon be available for purchase by Folio and Trollope Society Members to mark the bicentenary of the birth of this prolific author on April 24th 2015. It is confidently hoped that this will shortly be followed by the publication of a trade edition and that this new text will soon become the definitive one. At the Trollope Society Annual Lecture 2014 held at the National Liberal Club, Professor Amarnick enthusiastically described what had inspired the project and talked about some of the challenges which faced the small team. He explained how the newly restored missing passages complemented and strengthened the original work. The new extended edition of ‘The Duke’s Children’ will be a book that all Trollope enthusiasts will wish to acquire. The Trollope family have generously vested the copyright to the new text with the Trollope Society in the hope that it can be made available to a wide readership as quickly as possible. Currently the Folio Society is preparing its publicity material which will be going out to Members at the beginning of February 2015. Associated with this they have sent review copies to significant Trollope Scholars for comment and the response so far has been very enthusiastic.